Boss Key’s latest really does put the ‘early’ in early access, but it’s got some sharp ideas going on. It’s perhaps a little contradictory to say an early access title feels unfinished, but over the last few years certain unspoken standards and bars have been set by other popular early access games. Radical Heights isn’t too worried about that, with this release’s ‘Xtreme Early Access’ title feeling particularly apt. This truly is a game still figuring out what it is and what it can do, but buried in there are some interesting ideas to twist and augment the established battle royale experience. So, yes: this is another battle royale game, and after the struggle to make a success of team-based shooter LawBreakers it’s easy to see what Boss Key might be thinking. At a cynical level it’s them reaching for another popular flavor-of-the-month genre, but there’s enough different here to the likes of PlayerUnknown’s Battlegrounds and Fortnite to pique one’s interest. The differences are there from the off, though they’re initially relatively minor. 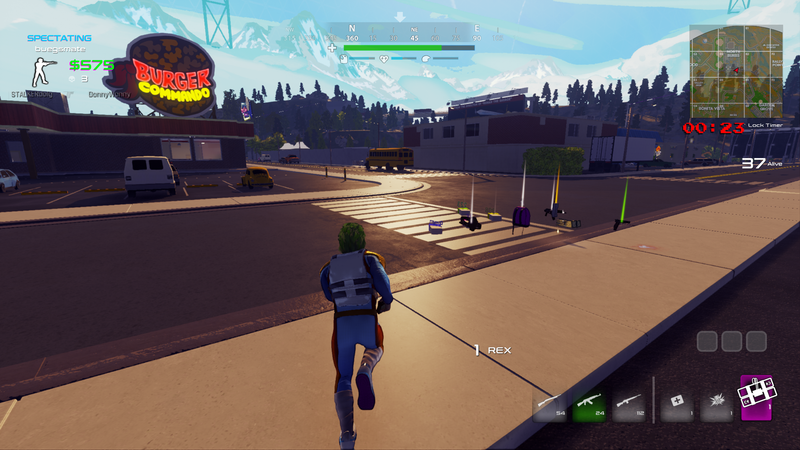 You’re still dropped onto an island, for instance, but in the stylized world of Radical Heights you don’t need a parachute – you instead quite literally hit the ground running. Also plainly different is the sense of style, with more abstract comic-like or realistic art both avoided. In truth it ends up somewhere in the middle, with a realistically-proportioned world and characters draped in the neon, eccentric color schemes of the eighties and the trappings of an over-the-top game show. That eighties theme runs deep into the world design in general, and you’ll find yourself battling it out in places like arcades filled with knock-off versions of classic games of the decade. The game show aesthetic does justify the one mechanic that most sets Radical Heights apart from its peers, however, and it’s also the mechanic that makes the game most immediately exciting: a proper in-game economy. It’s a lot like a game show, you see, where part of the aim is to earn and spend money. All of the other battle royale games have some sort of in-game currency, but Radical Heights mixes things up by dragging this system into actual matches. For a start, cash is just about everywhere out in the world. You can smash open things such as cash machines, lockers, and cash registers in stores, and sometimes it just rains money in parts of the map for no good reason other than to fill players’ coffers. 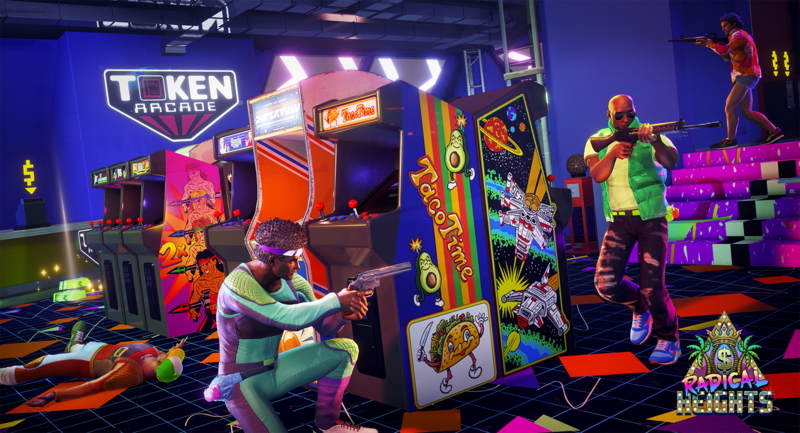 Money makes Radical Heights’ world go around thanks to the vending machines containing high-end weapons and gear scattered across the map. While weapons can be found out in the open, the best stuff (color coded to classic RPG loot table colors) will typically be locked away, waiting to be purchased. 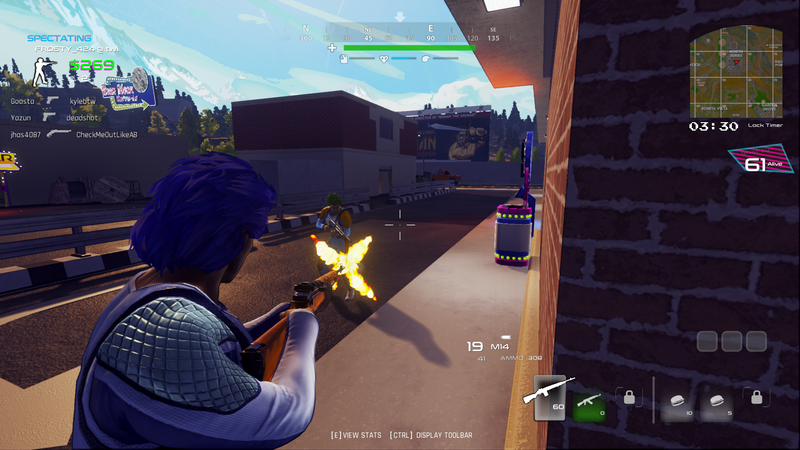 That tense battle royale dash here isn’t just to find a good weapon drop, it can now also be to find a vending machine with something you want and then desperately traverse the map looking to find the cash needed to get that amazing machine gun before somebody else grabs it. All of this has an impact on the general flow of the game too. Special prize doors, vending machines and other key components of this system can be used as a honey trap if you’re already geared up or can make the dash all the more tense and terrifying if you’re not. The map still closes in over time, but the flow of the in-game economy also serves to move players around the map. The game show mechanic plays into all aspects of this system – announcers will boom that new goods are incoming, or special loot containers will only cough up what’s inside if you stay near them for a set period of time. If you end up with too much loot you can exchange unneeded stuff for cash at certain vending machines. On top of all this, there’s the ability to bank your cash at ATMs – so essentially you can put money you pick up in one match away to save it from being lost if you die and use it in another match later on – though in that later match you’ll then need to find an ATM and withdraw your stored cash. As mentioned above, that leaves you vulnerable – and you can only withdraw cash $100 at a time, so to get together the two grand or more for a high-tier weapon you’ll need to stand near an ATM for quite a while. Outside of matches, that cash can also be used to permanently purchase any items of clothing you’ve found laying out in the world. You can only buy stuff you’ve found naturally in the game world with the in-game cash, though you can also pony up some real money to buy things directly if you prefer. The cash system is an excellent concept that’s already doing a brilliant job of setting Radical Heights apart from the competition. It’s a new tactical wrinkle for battle royale, with the potential for cash to carry over between games a huge incentive to play carefully while the manner in which gear is dished out serves to encourage you to risk everything often. It’s a strong idea, and where something like Mavericks: Proving Grounds seeks to revolutionize battle royale through player counts and simulation, Radical Heights goes the other way. Infused with a ridiculous, over-the-top game show flair, it’s what a Smash TV battle royale game would look and feel like. The rest of Radical Heights remains a bit of a question mark, however. This is one of the rockiest early access games I’ve ever played – I’m used to bugs and errors, but there’s just something about the way the game moves and handles that feels like the earliest, most experimental work. That makes sense, though – this project clearly came in hot, with LawBreakers having only just closed for business recently. Some of the other attempts to inject a little more variety into battle royale aren’t nearly as interesting as others, either. BMX bikes and zip lines are cool, but in truth they don’t offer much to really do something different with the genre. Still, I’m amazed it’s been released so soon, and doubly stunned that Boss Key feels confident enough to charge for ‘Founder’s Pack’ DLC already. The cash system alone means Radical Heights has my attention, however. Given time and an audience that sticks around Boss Key might well be able to make the other mechanics, general flow of the game and punky eighties visuals work better for them – but that cash system is a unique, interesting foundation for a new battle royale game. I’ll be watching how it evolves with interest. If you’re feeling brave enough to give it a show in its current state, Radical Heights is in free-to-play early access on Steam right now.